You are here: Home » Ladies, Strike Up The Band! Daley: There has been resistance here and there, but largely, how I’m seen seems to do with how well I play for the situation I’m in. If gender is a problem, I don’t want to be there anyway. Jones: Yes. I didn’t take up the drums in fifth grade because there were no other girls from my class doing it. [She describes the resistance that started in eighth grade, with tuning up.] “One of the saxophones is flat” someone says, and I’m the only girl in the section, and they all say, “Jessica is flat” continuing on up to adulthood. Now I can look back and see that it is tied in with an exploitive culture that breeds relating to women as objects and extensions of men. Also, being a minority always has the potential to be an “othering” experience; depending on the people around you. I pretty much stayed with my comfort zone, which included a lot of sane and supportive men. McSweeney: When I would show up to a gig or a jam session where no one knows me, there has been hesitation if I could play or not. The only resistance I had was my parents. They were paying for violin and piano lessons and my mom was not happy about the bass for a long time. I told her it was a hobby. Parrott: Yes and no. I grew up around a bunch of guys and we had a band in a small town. Being an inexperienced woman is more of a disadvantage than being an inexperienced man. Older musicians might have been a little less willing to take on a woman. There were times I just wasn’t part of the mix. Thank goodness I was able to make a living doing what I do. I was so inspired by the film…so many of those women who stuck their necks out. Weisz: There have been occasional comments, directed toward me, that girls didn’t play brass instruments. I learned early on that it became more what I did with the opportunities I was given and letting all of it inspire me to create opportunities for myself and my own groups. GALO: Has being a woman in music played a role, positive or negative, in getting an agent or producer or how audiences respond to you? Caswell: I suppose gender and sexuality will always play a role in how a musician, male or female, is promoted and that agents/producers view femininity as a “hook.” I hope the music made and stories shared through my violin have been what has caught the audience’s attention and that the feminine elements in my music are viewed not as a weakness or strength, but rather another perspective. Daley: I know very few musicians who have agents, regardless of gender. A percentage of what most jazz musicians make isn’t appealing enough. I bet most jazz musicians book themselves. Producers are hired for specific projects, and I’ve not seen them turn down any music they like. Jones: I don’t know. I think now a lot of people are more ready to listen instead of just watch when they see a woman play, especially younger people. McSweeney: I have just tried to show up to the job and play the best that I can. Because I don’t sing lead vocals there has been no reason for an agent or producer to pick me up. Parrott: Here’s the thing — my perspective on it now… I’m 43 and I’ve been a professional since I was 17. I’ve gone through a lot of different stages. I also sing now, which gives me a different perspective, not just bass playing but seeing the world. Do you have to prove yourself more? Probably true, still to this day. But it seems very uncool in the circles I’m in not to include women. Weisz: I don’t have an agent or producer. The reason given was that jazz trombone was simply not a popular enough instrument, and that jazz music itself was not a popular music. Most of my career I have been one of a few women (or the only one) performing in an ensemble (with the exception of the Diva Jazz Orchestra.) Audience response remains a bit mixed. The documentary The Girls in the Band really shows whose shoulders all of us stand upon, those marvelous musicians paved the way! GALO: Is it important to you to work with other women musicians, to band together in a sense to strengthen your resolve or your playing? Caswell: I seek to be around those musicians, male and female, who inspire me through the music they make. Sometimes sessions have been comprised primarily of women, sometimes of men. Sometimes I’ve been the youngest member of the band, sometimes the oldest. No matter the scenario, I cherish the diversity brought to the bandstand. Daly: I love playing with other women musicians, as we seem to have a bond since we know what we all go through. Mary Ann McSweeney is the bassist in my band because I love her playing and we’ve been friends for a long time. Jones: It is always a relief when there are good women musicians around. It’s relaxing to not carry the burden of “otherness” which is so often present. McSweeney: The most important thing for me is to play with great musicians, whether they are female or male. I love playing with Claire Daly and Sheryl Bailey, but we don’t play together just because we are women. We play because we connect musically. The perk on that is that we became great friends. Parrott: I was in Switzerland for two weeks and I was watching jam sessions, how they were going down, and women were definitely included. [Parrott described a younger woman musician she works with and the obvious difference.] There are certain things she may never have to deal with. Will we ever be treated equal with men? The world is crazy that way. Weisz: It is important to me to play with musicians whose sound and creativity inspire me! Whether they are male or female is irrelevant. GALO: Do you feel any limitations as a working musician? How has it affected your personal life? Caswell: It’s probably safe to say that every musician has his/her insecurities about certain elements of their career. I’m lucky to have a partner who too is a professional musician of similar focus and dedication to his craft. Together we support, challenge and motivate each other in both our musical and non-musical endeavors. Daly: I actually think that the fact that I’m a woman in jazz is something for other people to think about. My mission is to play my best. I believe I have a lot to do with creating my life, so I try and stay where the atmosphere is warm. Jones: I do think the raising a family/being a jazz musician dichotomy is the same struggle and result that a lot of women have in other industries. I love seeing the new generation of young women players, who seem to have less of these stigmas and dysfunctional experiences behind them and can approach things more grounded and maybe innocently, without being pounced on. McSweeney: The limitations are time and money right now. I am a side person for so many people that I have a hard time being able to focus on my own project as a leader. My husband and I would like to put out a couple more CDs. He is an amazing trombonist (Mike Fahn). Parrott: The big one…the family issue. I chose not to have a family. In my first marriage, I had two step-kids. When I was on the road they had two parents. I didn’t have to put up with the nitty-gritty stuff. In my current relationship, I’m also a step-mom. And I’m comfortable with that. I work with a lot of men my age and older and they’re great dads but the wives are home. Weisz: Most musicians that I know are like myself: freelancers and workaholics. We do this every day, practicing, working on our craft in all the diverse areas of music — performance, composing, teaching…it is a lifetime process. So, for the personal aspect of living a life in music there are no limitations. My life in music is probably the biggest part of who I am as a human being. 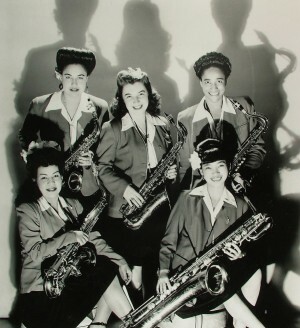 Featured image: The sax section of the International Sweethearts of Rhythm. Photo Courtesy of: Judy Chaikin.